Russian President Vladimir Putin was expected Friday in Paris for talks with French counterpart Jacques Chirac on topics like Iran, the Middle East and efforts to boost economic ties between their countries, officials said. The two leaders were to sign a deal for French construction company Vinci to construct a six-lane superhighway between Moscow and St. Petersburg, French presidential spokesman Jerome Bonnafont said. They are also to discuss Russian state-owned bank Vneshtorgbank's acquisition of 5 percent of the capital in the European Aeronautic Defence and Space Co., Bonnafont said, though he declined to give details. Moscow wants to increase French investment in Russia, which totaled US$905 million (Ђ710 million) in 2005. However, a recent Russian announcement that the country could revoke a French energy firm's license to operate oil fields in the Russian arctic threatened to throw a pall over the discussions, reports AP. Russia's Natural Resources Ministry said Thursday it was considering revoking French oil firm Total's license to extract oil at its Kharyaga project. It was not clear whether the two leaders would discuss the issue. Putin was expected to unveil a monument at Le Bourget airport northeast of Paris honoring the Normandy-Niemen squadron of French and Russian soldiers who fought together against the Nazis in World War II, French officials said. 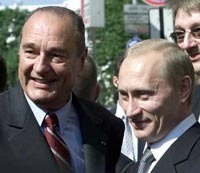 Chirac and Putin's bilateral talks were to come on the eve of a three-way summit with German Chancellor Angela Merkel in the town of Compiegne northeast of Paris. The three-way talks were expected to center on issues including Russia-EU relations, Afghanistan, Iraq and Kosovo, Kremlin officials said. The United States, Britain, Germany, France, Russia and Italy are overseeing U.N.-mediated talks on the future of Kosovo, where an ethnic-Albanian majority is demanding independence from Serbia an effort opposed by Belgrade. Putin has repeatedly said that independence for Kosovo could set a precedent for other breakaway regions, such as Russia's own province of Chechnya. Russia is a traditional Serb ally.